This innovative, comprehensive tool enables companies to quickly and credibly assess the costs and benefits of upgrading to Microsoft’s Windows 7, based on extensive research. The Windows 7 ROI Tool provides a robust framework for evaluating the business value (ROI) of Window 7, to arm companies with the information needed to develop solid business cases for Windows 7 deployments. The system also includes: Windows 7 feature assessment, TCO analysis, the additional business value of the Microsoft Desktop Optimization Pack (MDOP), and analysis of PC management best practices and maturity levels. The tool can also be used by service providers consultants to articulate the business value of their Windows 7 solutions. It can be customized, for example, to illustrate the service provider’s implementation methodologies. This tool was developed by Hall Consulting & Research LLC (hallcr.com) and was not sponsored/funded by Microsoft. “Scenario/profile” inputs are editable. All other content is visible and functional, but cannot be modified by the user. A wide variety of common scenarios can be assessed. Enterprise-wide license. May not be distributed outside the organization. Contact HCR for alternative licensing arrangements (e.g. for service providers / consultants) and for customizations and support services. Benefits: IT labor TCO savings, power savings, avoidance of third-party-software/infrastructure, user productivity benefits, and potential impact on non-financial KPIs (key performance indicators). The model creates dynamic lists of key Windows7/Vista features (based on the feature assessment) that enable each benefit. Supports rapid (30 minute) or detailed (5+ day) assessments - This model was designed to provide either a rapid assessment (simply by selecting a scenario and entering basic organizational profile data) or a very comprehensive (5+ day) assessment by modifying hundreds of detailed inputs. Pre-populated with default costs and benefits - Sample input data is pre-populated throughout the model based on profile data and the Windows 7 feature assessment and is re-calculated as inputs are modified. Data/estimate sources are listed. The user can (and should) overwrite any of the pre-populated defaults. Default values are based on detailed customer studies performed by HCR, analysis of features, subject matter experts, and a variety of other research sources. Supports most corporate client OS deployment scenarios - Including hardware refreshes, forklift upgrades, Lite/Zero Touch Installations, Software Assurance, etc. Licensing analysis – The tool assesses the costs of common licensing options: Select Agreement (with and without Software Assurance [SA]) and Enterprise Agreement (EA). The tool also estimates added costs and benefits of MDOP (Microsoft Desktop Optimization Pack); which is included with SA/EA. Windows 7 feature assessment – Enables the user to rate the likely usefulness/adoption of 180+ Windows7/Vista features. This assessment impacts the benefit calculations and the list of enabling features for each of the hundreds of benefits. The tool displays the benefit value of each feature. Maturity assessment – Leverages Microsoft’s Infrastructure Optimization (Core IO) maturity model. 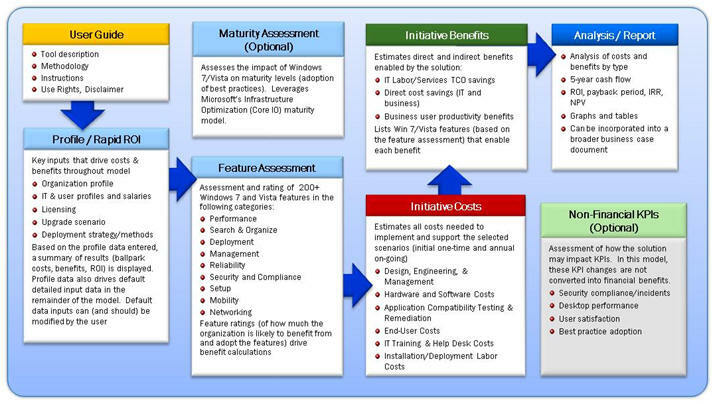 Enables the user to assess the likely impact of Windows 7 on maturity levels (adoption of best practices). Protected, yet customizable - Essentially all values can be modified. Formulas and other areas of the model that should not be modified are protected (locked) to maintain integrity. Version check - When opened, the tool checks to see if a newer version is available for download. Based on industry-standard calculations, industry-leading methodologies, and extensive research - It is as transparent as possible so the user is able to understand how the costs and benefits are calculated. 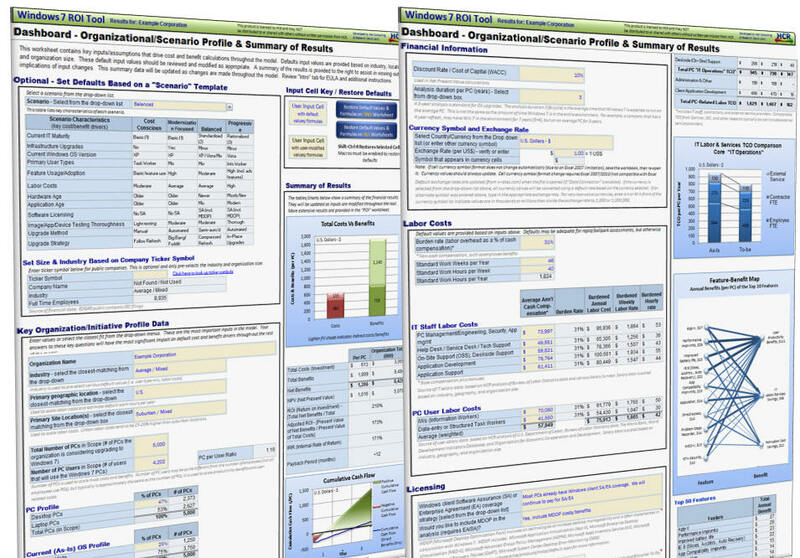 The calculation engine is based on or aligned with research/statistics from a variety of sources, including Gartner, IDC, Forrester, Help Desk Institute, SEC, Bureau of Labor Statistics, World Bank, salary surveys, Information Week, detailed Windows 7 TCO studies, over 80 published Windows 7 case studies, and many others. 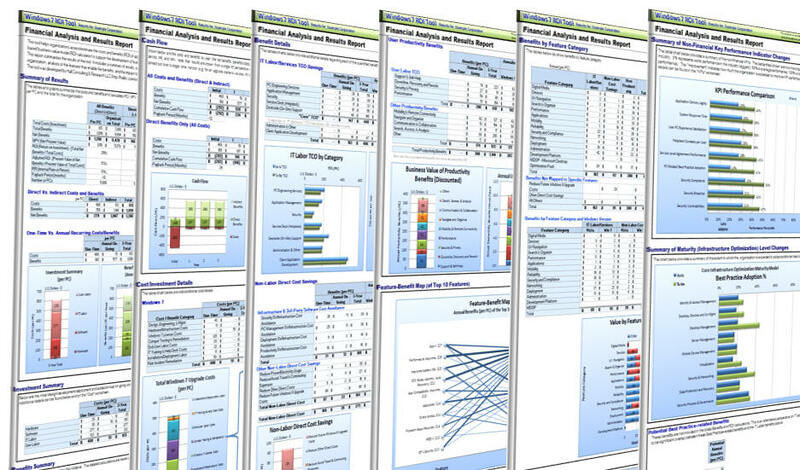 Extensive use of graphs/charts to enhance understanding of results (for example, dynamic feature-benefit maps). User-friendly - The workbook contains instructions, descriptions, and references. Results are updated real-time and are displayed graphically throughout the model. Includes macros to restore defaults and mark user-modified cells. Although the model is user-friendly, we recommend users have at least a moderately-advanced understanding of business value concepts and operating systems to develop a credible business case. *NOTE: Pre-populated (default) cost and benefit data should not be used for making investment decisions. This tool cannot accurately/credibly estimate costs/benefits without significant user review, validation, and adjustment of many data inputs (the detailed inputs should be customized for each particular organization). Pre-populated data is based on research, but may not represent average/typical project results and may not be based on statistically significant research. Pre-populated data should only be used as a starting place for assessing the business value of your particular organization and initiative. If your organization has purchased an enterprise-wide license to use this software/document throughout your organization: You may NOT distribute this software/document to anyone except employees of the organization. You may NOT attempt to modify any “Protected”/”Locked” portions of this software/document. You must maintain all copyright and other notices contained in this software/document. If this is a free “Preview”: You may use, copy, redistribute, display, print, and reproduce this software/document. Before making any changes to the workbook, save the workbook under a different name. This will preserve the original default values and formulas so you may return to them at a later time. Navigate the workbook using the worksheet tabs at the bottom. Start with the "Profile" and “Features” worksheets. These worksheets contain the most important cost and benefit drivers. You will also see a summary view of the costs and benefits of the scenario modeled. Enter/edit data in the "input" (light yellow) cells with blue text and double outline. Edit (overwrite) the default values to customize results for your particular organization/initiative. Review the “ROI” worksheet to pre-view the costs and benefits. Review the detailed default metrics and calculations in the IO, cost (red tabs), benefit (green tabs), and risk (yellow) worksheets. The "Financial Analysis" report (or any other worksheet) can be printed or saved as PDF/XPS. Portions of the model may be incorporated (e.g. “Paste Special As Picture”) into a more comprehensive business case-type report. If fee-based consultative guidance and/or customizations are desired, contact HCR. This information is provided to you as a tool “as is” with the understanding that there are no representations or warranties of any kind either express or implied. HCR and suppliers/vendors disclaim all warranties including, but not limited to, implied warranties of merchantability or fitness for a particular purpose. HCR and suppliers do not warrant or make any representations regarding the use, validity, accuracy or reliability of the tool or the results of the use of the tool. In no event shall HCR or suppliers be liable for any damages, including those arising as a result of HCR or supplier negligence, whether those damages are direct, consequential, incidental, or special, flowing from your use of or inability to use the tool, or information provided herewith, or results of the tool's use, even if HCR or suppliers has been advised of the possibility of such damages.